February 26, 2010- Full Department response to a WSF in Wayne Twp. February 24, 2010- At 06:31 Stations 1,2 & 4 were dispatched to the area of 1 South Berne Street for a reported tree down. Chief 722 (Sattizahn) arrived on scene to find a large tree blocking both lanes of the roadway. Crews cut and removed the tree from the roadway and were cleared from the scene after 25 minutes. February 22, 2010- The beeps tolled at 14:12 sending stations 1 & 4 to 1000 Seton Drive at Seton Manor Nursing Home for an Automatic Fire Alarm assisting Districts 56, 42 and 47. However, before any units could even go responding, they were all cancelled off due to a faulty activation. February 21, 2010- At 08:24 the Schuylkill Haven Fire Department was sent to 625 East Main Street, Schuylkill Haven Borough, at the Schuylkill Haven Area High School, to set up a Landing Zone for incoming Medevac 7. The LZ was established and the apparatus remained on scene for about a half hour until “the bird” took flight. February 20, 2010- At 10:51 stations 1 & 4 were dispatched to the area of Deiberts Valley Road and Schuylkill Mountain Road, South Manheim Twp, for a motor vehicle accident with injuries. As units arrived on scene they found 1 vehicle into a tree with an injury. Crews assisted with patient removal and transport to the awaiting ALS truck and cleaned the scene from fluids and debris. Once the vehicle was removed by the “tow truck”, all units were released. Pictures to be loaded shortly…. February 18, 2010- At 18:22 hrs Stations 1 & 2 were dispatched to assist Fire Districts 39, 42 & 47 (Auburn, Deer Lake, and Landingville) at 95 Hickory Drive, West Brunswick Twp, for an Electrical Fire in Omnova Solutions (formerly Reneer Films). As units arrived on scene they advised of a fire in the ceiling. Command then had Fire District 56 placed on stand-by for a possible response. The electrical fire was quickly extinguished and crews checked for any extension on the interior & exterior of the roof. Chief 723 responded with the Haven units and they were on scene for about 2 hours. February 18, 2010- At 15:14 stations 1 & 2 were dispatched to the intersection of St. Peter and Market Streets (Schuylkill Haven Borough) for a motor vehicle accident with no injuries, but with fluids down. Duty Chief 723 (Donatti) arrived on scene first and advised county that there was no need for any fire apparatus and cancelled all units before arriving on scene. At 04:35 Stations 1,2, & 4 were dispatched to the area of 400 W. Columbia Street for a heavy odor of Propane in the area. Crews arrived on scene and searched for a possible source of the odor, but determined everything to be normal. Time out was about 20 minutes. 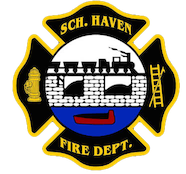 February 14, 2010- At 10:21 all 3 Schuylkill Haven stations along with District 41 (Cressona) were dispatched to 1544 Route 61, North Manheim Twp, for an automatic fire alarm at the Surgery Center in the Cressona Mall. Crews immediately gained access to the building and were met with a light smoke condition. Chief 723 (Donatti) advised all incoming units of the smoke condition and requested Ladder 51 from the city to ladder the rear of the building.Additional personnel were sent into the building while another group was sent to the roof to conduct further investigation. After about 5-10 minutes the source of the strong odor and light smoke was determine to be a malfunctioning mechanical unit located on the ground floor. The maintenance supervisor of the building was notified and all Schuylkill Haven units cleared the scene. Time out was about 1 hour.